Games ran by their authors are just better, but most gamers don't get the opportunity to experience it. 1) Adventure Authors often aren't celebrated for the amount of enjoyment they bring our lives. 2) Conventions often do a poor job getting Adventure Authors together in one place so other gamers can enjoy their stories. The D8 Summit Charity Convention seeks to change that. We work feverishly each year to bring you more Adventure Authors, running the content they wrote themselves for you. 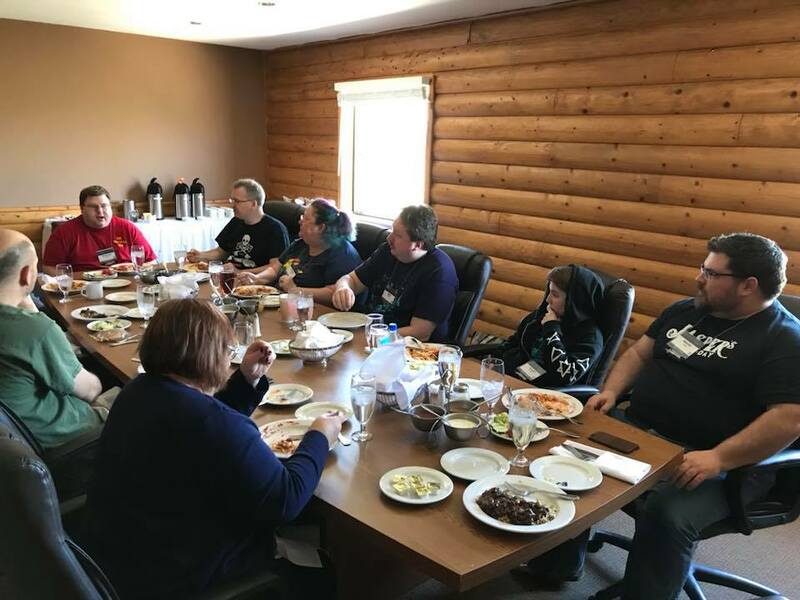 We don't just look for one type of author either - we bring together Adventurers League administrators, writers for Convention Created Content for Adventurers League, authors of adventures for other games such as Call of Cthulhu, designers of Escape Rooms, board game developers... As many quality creators of gaming content as we can pack into one weekend. More than you can possibly experience in one weekend. This year, over 20 Adventure Authors will be gathering at the D8 Summit Charity Convention to run their games for YOU! As we can, we will populate and publicize these names. Until we can expand on all of them, peruse and enjoy this splat list. Try to schedule some of their games at the D8 Summit, because an opportunity like this only comes once per year. Also new this year, six Adventure Authors competed for a chance to write FOR YOU! Introducing... The Iron Author Competition! It's like the Iron Chef of RPG authorship, and you can experience their content only at the D8 Summit Charity Convention. Two sets of adventures are offered in the Iron Author series this year, including CCC-DES-01-03 through -05 for levels 5-10, and CCC-DES-02-01 through -03 for levels 1-4. Fenway Jones, author of multiple Adventurers League adventures for D&D, as well as the found of Jaspers Game Day (a charity seeking to end teen suicide), and SHE IS WRITING FOR THE D8 SUMMIT THIS YEAR!!! With our regrets, we have to announce that Jay Africa, once invited to share games at our convention, will not be in attendance this year.